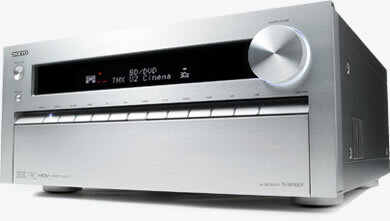 Onkyo completes their 2011 AV receiver range with a a brace of 3-D capable high-end models. The TX-NR5009 and TX-NR3009 are both 9.2-channel AVRs and come complete with THX Ultra2 certification. Audio features include support for DTS-HD Master Audio and Dolby TrueHD audio codecs, DTS Neo:X processing and automated room equalisation/correction using Audyssey technology. Video is handled by the onboard HQV Vida chip, with a dedicated stage of video tweaking allowing future-proof upscaling to the next-generation 4K resolution. Each receiver is network-enabled, offering Spotify, last.FM, Napster and Vtuner integration as well as DLNA-powered media playback over a home network. Continuing the theme of flexibility, the receivers play a wide range of file formats, including FLAC, WMA Lossless, WAV, AAC, Ogg, and MP3. Other ports include two USBs and an Ethernet jack. However, those with a wireless network will have to use Onkyo's UWF-1 wireless LAN adaptor, as Wi-Fi isn't built in. Both models include high quality backlit remote controls and can also be operated from an Android device or iPhone/iPod touch after downloading Onkyo's free dedicated app. Control things your way with Remote Techologies Inc.